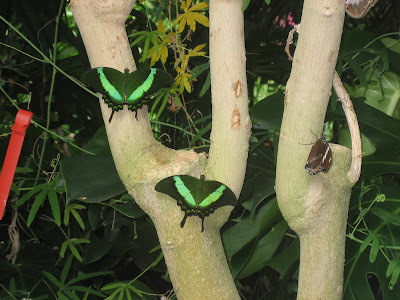 I have visited a couple of "butterfly zoos" in the past year or so, and thought you all would like to see some of the photos I took. 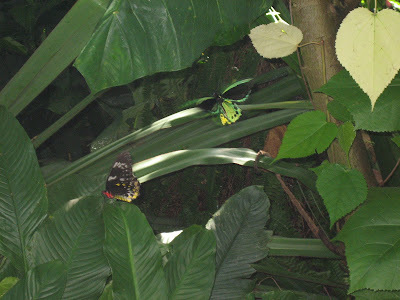 First, we see how the butterflies come to the zoos. 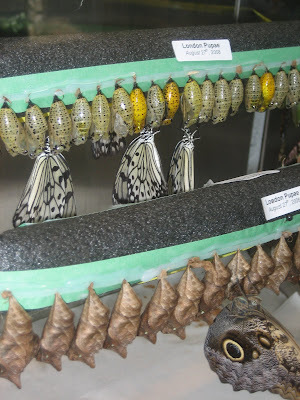 They are shipped from butterfly farms as live chrysalids (the "cocoon"), and they hatch when they get to the zoo. 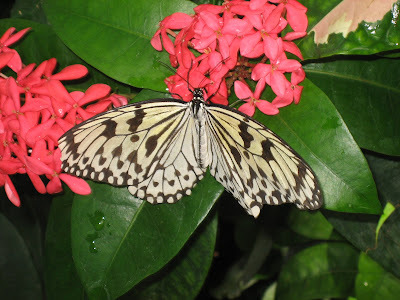 Here is Papilio palinurus daedalus, a species I sometimes use. They look so different in a natural setting! 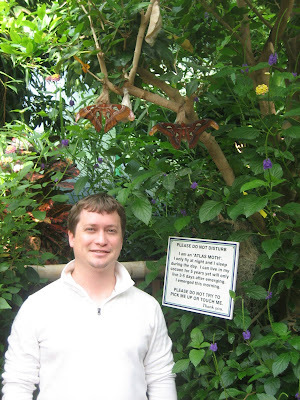 Below left, one of my favorite photos, a photo of my husband in front of some Atlas Moths (Attacus atlas), the largest moth OR butterfly in the world! Look at the size of them! I have used these before as well. 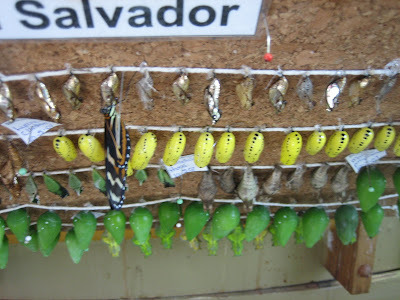 Note the Atlas Moth cocoons hanging above and between the two moths. They are so large that the "empties" are used by locals in Indonesia as coin purses! 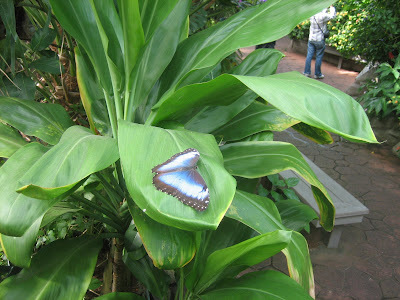 Below, to the right, a lovely photo of a Morpho (unknown species). You can see kind of how the butterfly zoo is set up in this picture; it's basically a greenhouse with lots of butterflies just flying free! 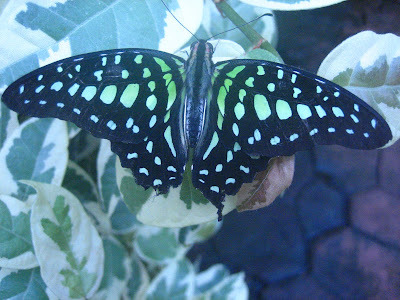 Below, Graphium agamemnon. One of my favorite species to use! Here, you see a caterpillar! 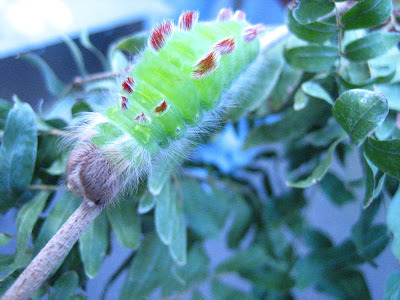 I can't say what kind of caterpillar; probably some kind of moth, judging from how hairy it is! 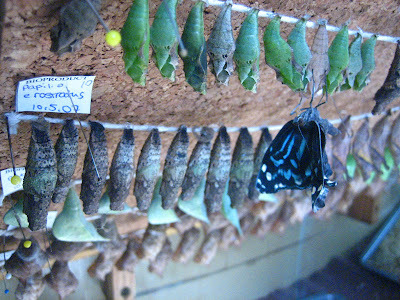 More photos of chrysalids and newly emerged butterflies! I think it's so cool how they have hundreds of beautiful live chrysalids all in rows like this! What a fun place to work at! Butterflies. The male is on the right, dancing for female. 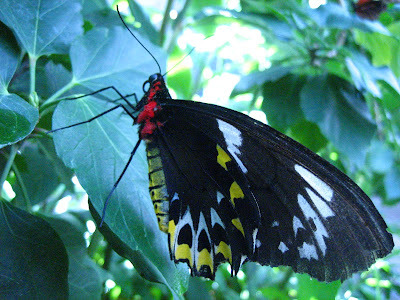 Here is a close-up of the female Birdwing. Notice how tattered her wings are. 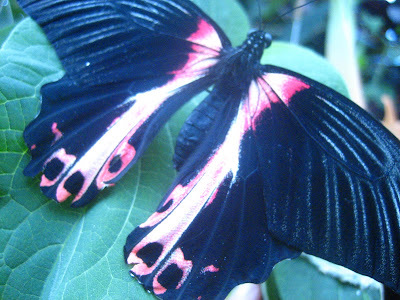 Most butterflies get surprisingly tattered and worn just from flying around. A close relative of our Monarch, this is Idea leucone, one of my favorites. Please visit my Insect Art Online Store! Contact me or sign up for the Insect Art newsletter! Insect Art is made of real insects from around the world. They come to me dried out and all folded up. I re-hydrate them to make them flexible again, and then spread them out on a styrofoam board with sewing pins and little strips of paper. I do not put any pins through the bodies of my insects; I like them natural-looking and lifelike. This makes the insects a bit more difficult to handle, but the end result is worth it. Lastly, I choose an art background for the shadowbox frame and glue the insects onto that. The whole process takes several days, and each end result is unique.